In our previous overview about the Zika virus, we described how the Zika virus spreads and what it does to the brain. For example, in the central nervous system, the Zika virus may cause microencephaly, a condition where a babys head is smaller than normal. In the peripheral nervous system, the Zika virus is associated with Guillain-Barr syndrome. In this disorder, the immune system attacks the myelin insulation surrounding a nerve. This results in muscle weakness and changes in sensation and pain. The Zika virus is an emerging health concern, but how exactly the Zika virus might cause microencephaly is not known. A recent study by scientists at Florida State University and Johns Hopkins University hypothesized that the effects of the Zika virus on the central nervous system may involve its effects on progenitor cells. 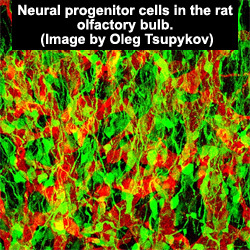 Neural progenitor cells are self-renewing cells that can eventually become neurons or glia. In the new study, researchers used cell cultures to study the effects of the Zika virus on developing neuronal cells. They used a special type of cells called the human induced pluripotent stem cells (hiPSCs). These special cells are derived from fibroblasts, and can be made to differentiate into a variety of cell types, including neural progenitor cells. The scientists were able to successfully transform hiPSCs into neural progenitor cells. The neural progenitor cells were then exposed to the Zika virus and the effects of the Zika virus on neural progenitor cells were studied. The Zika virus directly infected the neural progenitor cells. The infected neural progenitor cells produced Zika virus particles. Infection by the Zika virus caused increased death of neural progenitor cells by disrupting normal cell cycle processes. This study shows that the Zika virus can directly affect neural progenitor cells in cell culture experiments. Cell culture experiments are also called in vitro experiments because they are done outside a living organism in a test tube or a culture dish. The other type of experiment is an in vivo experiment where experimental procedures are done within the body. The in vitro model used in this study can also be potentially used to check new drugs that may be developed to treat Zika virus infection. Remember though that these experiments were done in cultures dishes, outside the actual brain. The effects of the virus inside the brain may be different. Nevertheless, the results of this new experiment suggest that microencephaly may be due to direct effects of the Zika virus on neural progenitor cells. Tang et al., Zika virus infects human cortical neural progenitors and attenuates their growth, Cell Stem Cell, 18:587-590, 2016.